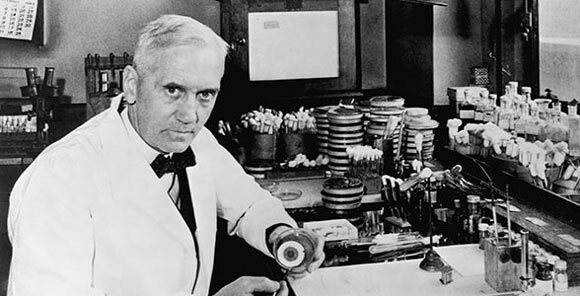 Sir Alexander Fleming was a Scottish bacteriologist who revolutionized modern medicine with his discovery of penicillin. He was born on August 6, 1881 in Ayrshire, Scotland, and was the seventh child of a farmer named Hugh Fleming. He first attended Loudoun Moor School and Darvel School in his childhood, then received a scholarship to study at Kilmarnock Academy where he studied for two years. He then moved to London to study at the Royal Polytechnic Institution there. Initially he did not enter the field of medicine and worked at a shipping office for four years. After coming into an inheritance from his uncle and at the suggestion of his brother, he decided to enroll at St Mary’s Hospital Medical School, from where he graduated with distinction and also received a gold medal on completing his MBBS. Until 1914, Fleming served as a lecturer at St Mary’s. Originally, he had planned to become a surgeon but then he got interested in the field of bacteriology which was a relatively new venture at the time. He worked under the patronage of Sir Almroth Edward Wright and adapted his innovative ideas and way of thinking. During World War I, Fleming served as a captain in the Army Medical Corps. During the war he continued to conduct research and noticed that the antiseptics being used to treat wounded soldiers were sometimes more harmful than the damage caused by the wounds themselves. He suggested that in order to let the wounds heal, they just needed to be kept safe and dry but this was largely ignored. At the end of the war, Fleming returned to St. Mary’s and became the assistant director of the Inoculation Department there. His research work began to gain repute and he was already a well known scientist before his great discovery. The discovery of penicillin took place in 1928 initially by a chance accident. After being away on holiday for a month, when Fleming came back to his lab he found that some cultures of staphylococci had been left outside by mistake and that these had caught a fungus. However, the cultures immediately surrounding the fungus had been destroyed. He consulted with his assistant and decided to conduct further research into the matter. This led him to realize that the fungus produced a substance that could kill harmful bacteria that caused diseases. Fleming named this fungus penicillin and tried to grow it in his lab. He published his discovery in the “Journal of Experimental Pathology” in 1929 but did not receive much attention at the time as most of his clinical trials had been inconclusive and penicillin could not be produced in large enough quantities to be useful. Fleming was convinced that the fungus had limited usefulness but his research was taken up by two researchers from Oxford University named Ernst Chain and Howard Florey. These two were successful in producing purified penicillin which became indispensable during World War II, and helped to save thousands of lives through its use in antibiotics. In 1945, as a result of their combined efforts and discoveries, Fleming, Chain and Florey were jointly awarded the Nobel Prize in Medicine. Fleming was made the head of St. Mary’s Inoculation Department in 1946. He was also the president of the Society for General Microbiology, and an honorary member dozens of other medical and scientific societies. He served as the rector of Edinburgh University from 1951 to 1954 and received dozens of honorary degrees from universities worldwide. Fleming died in 1955 at the age of 73. He was married twice and had only one child, a son named Robert who followed his father into the field of medicine. He received countless honors both during his lifetime and after his death including a knighthood by King George VI in 1944. He is buried at St. Paul’s Cathedral in London.